This entry was posted on May 2, 2016 at 11:59 pm and is filed under economic crisis, Europhobia, Foundations Economy, Plutocratic sycophants. You can follow any responses to this entry through the RSS 2.0 feed. You can leave a response, or trackback from your own site. That OECD GDP chart was dated 2012. The figure for 2015 is still provisional and indicating being below the GDP figure for 2008. Hi Paul! 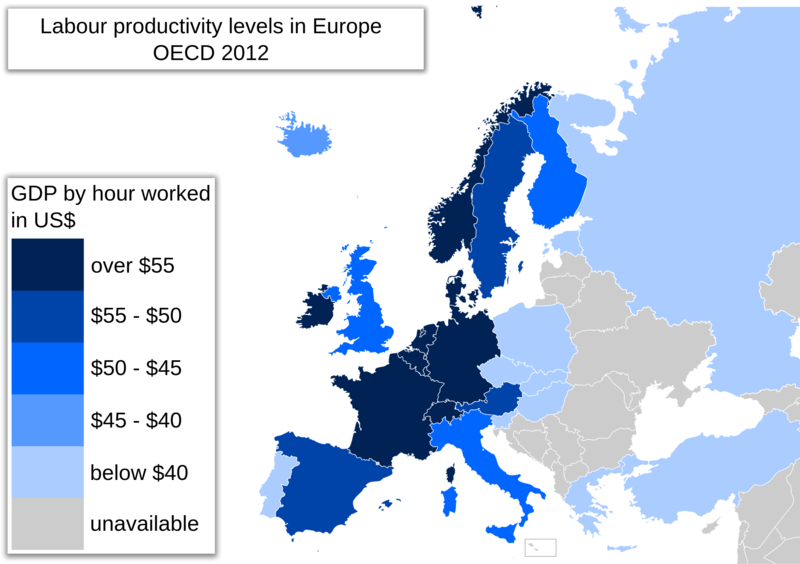 The map I showed was not a GDP chart, but a map of high productivity (GDP per capita, per hour). There was a problem initially, and the first map came out low resolution. I have put the high resolution one now. The numbers did not change much since 2012. Spain productivity per hour grew much faster since 2010, than that of the USA. Etc. “Norway, which is not an EU member, generates the most output per working hour, $37.99, a figure inflated by the country’s billions of dollars in oil exports and high prices for goods at home. The U.S. is second at $35.63, about a half-dollar ahead of third-placed France. Seven years ago, French workers produced over a dollar more on average than their American counterparts. The country led the U.S. in hourly productivity from 1994 to 2003. The gist is that a highly inefficient fossil fuel wasting country will have an inflated “productivity” and GDP… Because of the waste, precisely. France and Germany are above 2008 level in GDP, and growing faster than the United States at this point. The point made by Gmax, which is one of the points which I tried to make, is that US economists are in no position, on numbers alone, to trash the European project. The difference between US and European economy is, that the US economy is capital driven, while the European or more specifically the German economy is production productivity driven. Those, the US is more innovative, so more capital attractive. The main difference as I see it is that the cost of fossil fuels in the US is not even a third of that in Europe. Innovation? France produces better planes (military or not), better helicopters, launches more than half the satellites (in mass), and has better submarines. It’s not just a question of German cars (I drive one of the latter). Innovation? France again has the best mirrors, the most powerful lasers (the laser on Mars on Curiosity is French). A French astronomer woman just computed where the Ninth Planet should be (taking into account 200 known solar system objects and planets).